Everyone’s done for the semester and it’s time for new jobs, new cities, new friends and new news. Instead of the regular, weekly Sunday Sweep, this summer we’ll be posting twice monthly “cheat sheets” that span multiple topics in the news instead of just one. For daily updates delivered right to your inbox, consider signing up for the Daily Beast’s Cheat Sheet or New York Times news alerts. Here are three of the top stories in the news right now – what you need to know, when you need to know it, where to look to know more. Michelle Bachmann (left) was victorious in the Ames Straw Poll. Following a third place finish, Tim Pawlenty (right) withdrew his bid for the White House. 1. Ames Straw Poll – Michelle Bachmann, conservative member of the House of Representatives representing Minnesota, was victorious in last week’s straw poll in Ames, Iowa, a non-binding poll gauging the support for the then 10 candidates for the Republican Presidential Nomination. With 29 percent of the vote, Bachmann was followed by Ron Paul and Tim Pawlenty, with 28 and 14 percent, respectively. Following the announcement of the results, Tim Pawlenty made the announcement early Sunday morning that he will be ending his bid for the White House. The same day, Texas Gov. Rick Perry announced his entry into the presidential contest in Charleston, South Carolina. Want to know more? *Get the full story from CNN. *Read the complete results of the Ames Straw Poll. *WatchMichelle Bachmann’s reaction following the announcement of the results. Five are dead and at least 50 wounded following the collapse of a stage at the Indiana State Fair Saturday night. Image courtesy of Reuters. 2. 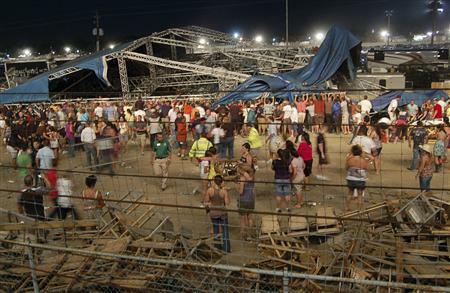 Stage collapse at Indiana State Fair – Five are dead and at least 50 wounded following the collapse of a stage at the Indiana State Fair in Indianapolis Saturday night. The audience was waiting for a performance by the country music duo Sugarland when a strong gust of wind toppled the rigging, trapping many under the structure. At a news conference Sunday morning, Indiana State Police First Sgt. David Bursten said more of the injured could die in the coming days. Amateur video was posted online almost immediately following the accident. The governor characterized the event as a “freakish accident”. Want to know more? *Get the full story from the New York Times. *Watch a video by Reuters showing the accident and audience reaction. *Read what Sugarland singer Jennifer Nettles had to say in a statement to the Associated Press. The East African country of Somalia is currently gripped by famine and political unrest. Image courtesy of CBS News. 3. Famine in Somalia – The United Nations has declared a famine in parts of Somalia following the worst drought in 60 years has forced thousands to leave their homes in search of aid. Unless the international community acts quickly, the UN is predicting the famine could spread, and quickly. But the crisis has been affected by more than just the weather – political unrest has also contributed. Aid agencies have had trouble operating in the country, due to the conflict. Al-Shabaab, an Islamist insurgent group linked to al-Qaeda controls much of the country and banned foreign aid from entering. Want to know more? *Get the full story from CNN. *Read an editorial by Josette Sheeran, executive director of the U.N. World Food Programme, about the epidemic and the power to end chronic hunger on a global scale. *Watch a report from NBC Nightly News about the famine.